Reduces and regulates blood pressure, reduces ECG abnormalities, lower viscosity of whole blood plasma, improves capillary microcirculation, increases immunity, increases synthesis of plasma albumin, and improvements in the plasma albumin/plasma globulin ratio, etc. After 8 years of clinical and laboratory testing, the Blood Stasis & Aging Research Group at the Shanghai Railway Central Hospital, headed by Dr. Yan, introduced its new herb formula, Herbal Yuth. A product of clinical development and scientific evaluation, Herbal Yuth was designed to serve as the foundation remedy for many of the conditions associated with aging in TCM. After studying clinical data and scientific finding on aging and senility, Dr. Yan arrived at a formula that combines ten of the most valuable herbs known to herbalists around the world for their excellent Qi producing quality. In addition, the formula promotes balance of yin and yang and helps to maintain Qi energy at its highest level. Contains no sodium, no artificial color, no preservatives. Chest tightness, chest pains, heart palpitations, coughing, shortness of breath, dizziness, lower limb edema, lack of appetite, migraines, poor mood and poor complexion. Symptoms due to poor blood circulation or blood stagnation such as irregular menstruation, painful menstruation, after stroke, limb numbness, etc. Not recommended for pregnant women. Keep out of reach of children. Maintaining good health and promoting longevity have been goals of mankind since ancient times. From the beginning of civilization people have been searching for the secret recipes of living a long and healthy life. Although aging itself is unavoidable, modern medical experiments have proved that none of us live as long as we may actually be capable of living. Traditional Chinese physicians believe that longevity is rooted in a balance of the blood’s vital energy and circulation. They believe that good health is maintained by the equilibrium of healthy blood and Qi – the vital energy that drives blood circulation. Now, after devoting centuries to studying health and longevity, traditional Chinese herbalists are integrating modern science with their vast knowledge of herbs to achieve new breakthroughs in our understanding of how herbs can restore health to the aged and potentially increase lifespan. Many factors including stress, the environment, mental states, and a poor diet can impair our well-being and disturb the body’s harmony and equilibrium. As we age, further changes naturally occur in our body that can reduce Qi energy and blood circulation. When this occurs, the body’s internal organs fail to receive vital amounts nutrients and begin to work less efficiently. In Traditional Chinese Medicine (TCM), as a person enters old age, there is a tendency to suffer from a deficiency of Qi, the vital energy which drives blood circulation. This deficiency can be the result of such factors as social stress, environmental influence, adverse mental states and illness or trauma. Eventually this deficiency can lead to poor blood circulation. In comparing blood samples taken from both young and elderly people, researchers at the Blood Stasis and Aging Research Group of the Shanghai Railway Medical Hospital discovered that blood samples from young adults is thinner and has a brighter hue than that of the elderly, revealing an apparent association between blood stagnation and aging. When blood stagnation occurs, the body’s internal organs don’t receive their normal nutrients and waste products aren’t carried away at a sufficient rate. The organs are unable to perform their functions, resulting in weakness, disease and aging. A cycle begins which aggravates the imbalance of vital energy and blood. Therefore, the essence of aging is blood stasis caused by the imbalance between Qi and blood. In Traditional Chinese Medicine, Qi and blood stagnation are the root causes of illness, and the key to the proper functioning of bodily organs is achieved by optimizing the performance of the microcirculatory or capillary system. This blood system acts as an internal exchange organ, functioning to distribute nutrients throughout the body, carry away metabolic wastes and regulate interstitial and endovascular fluids. Conversely, any breakdown of the microcirculatory system leads to a series of pathological changes involving the nervous, endocrine, and immune systems, while contributing to senility and speeding the aging process. To evaluate Herbal Yuth and estimate its effect on microcirculation, Chinese researchers conducted a clinical study of 150 patients ranging in age from 55 to 89 years. Test subjects took the product for a one-month period. The trial found statistically significant improvements of such common symptoms as chest tightness, chest pains, hearts palpitations, coughing, shortness of breath, dizziness, lower limb edema, lack of appetite, poor mood and poor complexion. Interpretation of the clinical results indicate that Herbal Yuth possesses the ability to expand coronary arteries and the arterioles of the brain and lungs, to raise T-cell immunity, and to promote the synthesis and metabolism of proteins. The formula should have excellent supportive actions on such elderly disorders as insufficient blood supply to the brain, coronary heart disease, chronic bronchitis, and hypoproteinemia. Herbal Yuth is a Chinese anti-aging formula designed to improve microcirculation and restore internal organ function. Chinese medicine considers blood stagnation to be the underlying cause of many conditions characterized by pain or lack of nourishment from poor blood flow. Damage to capillaries, thickening of the blood, and lack of new blood formation are the components of microcirculation problems Herbal Yuth is designed to support. Herbal Yuth’s ability to support microcirculation make it useful in support of strokes, angina, arteriosclerosis, thromboarthritis, migraines, and other circulatory disorders. Because blood flow to internal organ is improved, function of the liver, brain, heart, and other organs is also enhanced. As a sports formula, Herbal Yuth is valuable following injury or after workouts to reduce congestion cardiovascular functioning, enhance sports performance should follow ingestion. Since 1998, Chinese experts have agreed that Herbal Yuth is a major breakthrough in herbal products. Today, it is a popular herbal beverage used throughout China and the Orient. 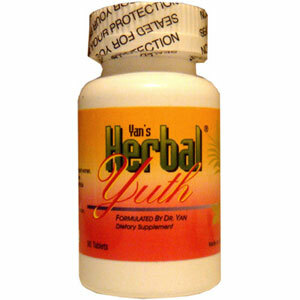 Herbal Yuth contains an assortment of pure, natural substances. These include elements of iron, calcium, magnesium, and manganese as well as an array of herbs traditionally used by the Chinese to balance the yin and yang and harmonize the body. Herbal Yuth drink is a mild, non-medical and non-toxic herbal beverage and may be enjoyed periodically or on a regular basis. Administration: Take 3 tablets, 1 time a day. Wait 2 weeks after stroke to begin administration. Do not use if you are or may be pregnant. NOTE: These experiments and clinical studies were conducted in China. The information in this article is to be used as a reference only, and no medical claim is either expressed or implied.